This publication is from the Joyce Record Club (which is no longer in existence) and is authored by Charles Garrod. It was originally published in 1986 and revised in July 1996. 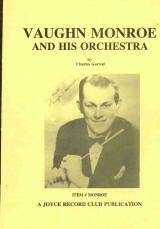 The discography contains 72 pages of information by recording session for Vaughn Monroe and his Orchestra beginning with the NBC Radio Broadcast from Seilers Ten Acres in Wayland, Massachusetts on May 8, 1940 to the last entry dated November 19, 1954. A 20 page index by song title follows.